In one of Alexander’s early campaigns, he traveled through Asia Minor in an attempt to conquer the Persian Empire. Alexander wanted to fight the Persians to silence them, in contrast to his father who wanted to form peace treaties with the Persians while he was on the throne. The conquest of Alexander began in the year 334 BC with 48,100 soldiers, 6,100 cavalry, and a fleet of 120 ships. (Rosiman. 2010) Accompanying his army was a baggage train which carried supplies for the soldiers. Alexander’s army encountered harsh conditions along the way that took an extra toll on the animals. The greatest difficulty for the animals was traveling through the desert. The extreme heat, lack of water, and sandy terrain drained their energy. Marching through the sand was complicated; the uneven soil caused them to stumble frequently and the sand didn’t support their weight like solid ground (Arrian. 2010). Instead, their feet seemed to sink through the sand rather than walk in it. The camel in the photograph above is the type of pack animal that Alexander would have used for his campaign. 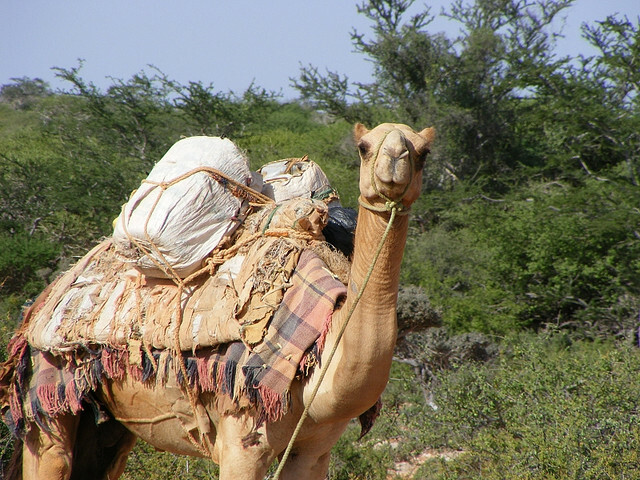 Although camels are well known for their ability to store water, they need to drink as much as other pack animals, but are able to go for longer periods of time without taking a drink. Engels, D. (1980). Alexander the great and the logistics of the macedonian army. (pp. 126-130). Los Angeles: University of California Press. Roisman, Joseph; Worthington, Ian (2010). A Companion to Ancient Macedonia. John Wiley and Sons. Shean, J. (1996). Hannibal’s mules: The logistical limitations of hannibal’s army and the battle of canne. 216 b.c. Historia: Zeitschrift fur Alte Geschichte, 45(2), 170-174.